An underappreciated facet of the maker movement is wearable technology. For this week’s Hack Chat, we’re going to be talking all about wearable and fashion tech. This includes motors, lighting, biofeedback, and one significantly overlooked aspect of wearables, washability. 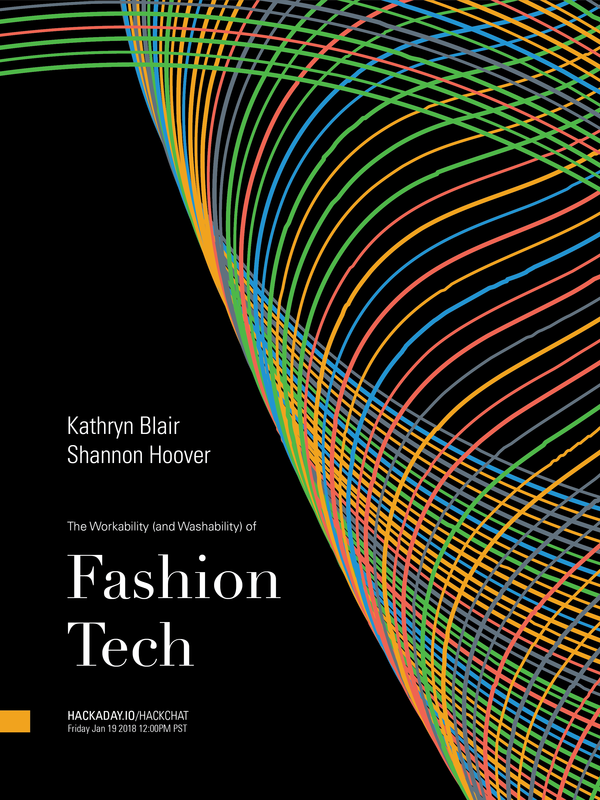 For this week’s Hack Chat, we’re sitting down with Kathryn Blair and Shannon Hoover to talk about the workability and washability of fashion tech. Over the last decade or so, wearable tech has become ever more popular, and these advances in the science aren’t just limited to amazing outfits lined with hundreds of Neopixels. Now, we’re dealing with biofeedback, clothing that regulates your body temperature monitors your vital signs, and necklaces that glow when the sun goes down. Kathryn and Shannon are part of the team behind MakeFashion, a Calgary-based outfit that has produced over 60 wearable tech garments shown at 40 international events. MakeFashion is introducing designers to wearables through a series of hands-on workshops built around developing wearable electronics and electronic wearables. One of the key technologies behind MakeFashion is the StitchKit, a development kit that’s now available on Kickstarter designed to add electronics to wearables. This means everything from uglier Christmas sweaters to interactive clothing. During this Hack Chat, we’re going to be discussing the design and engineering behind fashion technology, including biofeedback, how motors and lighting work with a human body, and how to design for washability. If you have a question for this Hack Chat, add it to the discussion part of the event page. Our Hack Chats are live community events on the Hackaday.io Hack Chat group messaging. This Hack Chat is going down Friday, January 19th at noon, Pacific time. Time Zones got you down? Here’s a handy countdown timer! Just think what wearables would do to the used clothes market. Was that a Grum reference? Well, now I find out that the Grum track is a cover of the David Bowie track. Unexpected. Now, in regards to detecting remote sensing and/or transmitting EMF in the EMS directed energy weapons like noted in MCL 750.200h&i, 750.224a, 750.543p, et.al..